This feature was written by Rachel Cole, who was a CUESA intern for the summer of 2008. Shopping at the Ferry Plaza Farmers Market isn’t tricky, but it is an art worth perfecting. Here are a few tried and true tips that will make even the most savvy shopper’s next visit to the market richer, easier and more fun. BYOB. Whether your aim is to be eco-friendly or fashionable, packing a reusable bag or basket is a great way to cart all your treats home. Instead of reaching for the plastic bags provided at most stands, bring cloth produce bags or a stash of plastic grocery bags from home. Handle With Care. Have you ever returned from a trip to the market with bruised, squished, and pummeled fruit? This can be particularly tricky when it comes to perfectly ripe Hachiya persimmons, soft figs, or delicate heads of lettuce. Try placing your fragile fruit in recycled plastic containers lined with a dishtowel for extra cushioning (one-quart yogurt containers work well!). Bills, Bills, Bills. With a little planning, transactions at the market can go smoothly. First, come with enough cash, so you can avoid the long lines at the ATMs inside. Second, bring small bills. Many of the vendors need to make change quickly, so leave the Benjamins at home. Lastly, don’t hold up the line; keep those dollars where they’re easy to access. Ditch the Shopping List. The best visits to the market begin with an open mind. Instead of making a list, let the produce that tastes best, looks the freshest, and whispers “eat me” shape your meal planning. You might even want to challenge yourself to throw your recipes out the window in favor of cooking up a spontaneous meal with whatever calls to you. Cosmetically Challenged. Some fruit farmers sell what are known as “seconds” at a significantly reduced price. These fruit usually have a few bruises or maybe a bug bite or two, but are perfect for baking into pies, making jams, and even putting in fruit salad if you cut off the ugly parts. If you don’t see seconds displayed, they may just be out of sight. There Are No Dumb Questions. In addition to being farmers, jam-makers, and bakers, the producers who sell at the market are also incredible resources. Whether you want to know the best way to cook beans, the differences between the Artic Rose and Artic Queen nectarine, or what biodynamic means, just ask! Super Taster. 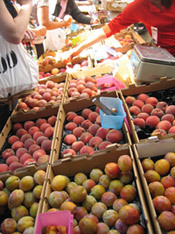 Sampling is helpful in a market with a sometimes overwhelming abundance of produce varieties. That said, savvy shoppers understand that―when they’re available―samples are generously provided by the producers, and not a substitute for lunch. Finally, even if one taste has double the flavor of what you’ll find elsewhere, please don’t double-dip. Compare and Contrast. It can be hard to resist filling your market bag with the first goodies you find. However, a teensy bit of self-control and a stroll through the entire market before you start your buying will often lead you to the best produce and the best prices. Report Back. The farmers and artisans take great pride in what they sell, but rarely get to hear what becomes of their products once they get toted off to your kitchen. If you have great fortune (or failure) with your purchases, come back and share your experience with the farmer; chances are good that they’ll want to hear about it. Do you have your own Insider’s Tip to suggest? Send it our way. Maybe we’ll publish it in an upcoming e-letter.